Feed the Need™ Cooking Team Building! Feed the Need™ - Put Into Action Your CSR Plan! Contact us now to see how we can take your team project and add a bit of fire and energy beneath it, contact us now. March 2019 - Feed the Need™, the #1 way to put into action your Corporate Social Responsibility (CSR) plan for 2019. Make a difference in your community by creating a delicious, welcoming meal for those in need while learning valuable team building skills along the way. A strong sense of gratitude prevails over your group with your charitable representative describes what families will enjoy the fruits of your labors this day. We guarantee not a dry eye in the house! April 2019 - Snax Packs - Savory snacks have become super popular. Create from an array of typical snack items but customized to your particular flavor profile. 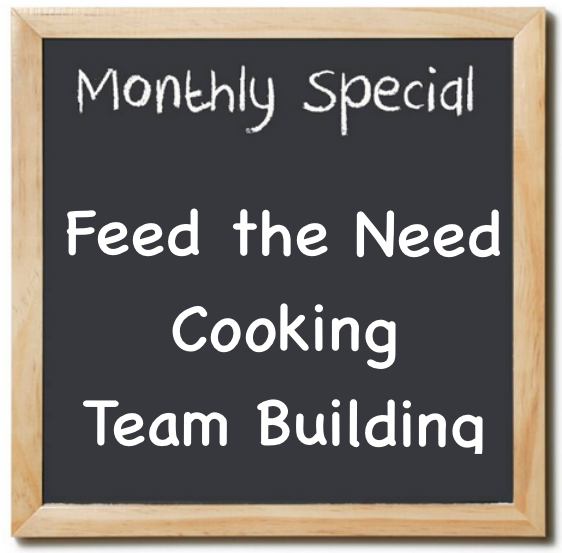 May 2019 - Team Cuisine - The original cooking team building with a few new surprises to challenge your group. June 2019 - Culinary Kickoff™ - If this is end of your fiscal year and you're looking to kickoff July with a full head of steam, then this program is perfect for you! July 2019 - Interactive Southwest BBQ - Combine the flavors of the Southwest United States with an exciting team challenge and you have the perfect formula to connecting your team to your organization's vision while having fun! August 2019 - Academic Professional Development - Time for academia to reconnect and recommit to this year's plan of empowering their students to be the best that they can be!